Well, week one is done. Just three weeks and two days to go. What to say about this week? I think mostly it has gone alright. We've had mostly really good meals. There have been a few duds in there (I'm looking at you beef and mushroom soup) but for the most part I've been enjoying what we've been eating. I haven't missed any of the sweets or the breads particularly. We significantly cut back our consumption of fruit in keeping with the Whole30 guidelines of focusing on meat and veggies. I've missed the fruit, although not as much as I thought I might. But on a whole, I haven't been craving sugar. I don't think about it, basically at all, and I don't feel like I'm going to die if I don't get it. I didn't mind not having a cupcake and icecream bar at Easter. I just wished I could eat some of the ham because a plain hamburger is bo-ring. So based on what I've read I was expecting to feel like this. Go read THIS article and come back. All that stuff in the first week about the sugar hangover, and then feeling grumpy, and then being exhausted? Yeah, it's just not happening to me. This whole week has just felt like a series of day ones. In terms of how I'm feeling, frankly, I feel normal. I still wake up hungry and get hungry between meals, wanting a snack (which I haven't been eating). My energy level is the same as it's been for a while. I'm not feeling exhausted or run down. I'm just feeling normal. I'll be very curious to see if I start getting the vivid dreams they talk about during the second week. My mind has quite the active imagination during the night anyway so it'll be fun to see if the content of my dreams change to fit their mold. But for the rest of it? Nada. Now I do want to say that as much as I've been talking about my headaches, in reality?, it's not like they're exactly new to this week or anything. I've been getting headaches almost every day for a while now. They tends to peak in the later afternoon, be mostly gone by the start of dinner, and usually completely gone by the end. Maybe I'm just hungry. Or maybe that's when I notice it most because I've forgotten to drink water all morning and it's finally hitting me. I really have no idea. It'll be something that I'll continue to pay attention to as the weeks go on but I'm not sure how much my diet has been having an influence on them. My biggest complaint for the Whole30, though? It's not doing the research and finding recipes that sounds good. It's not doing the cooking because, goodness, we've been cooking daily for more than four years at this point. It's not the grocery shopping and having to find and experiment with different veggies. It's how expensive all the bloody food is! At this point we're on track to easily spend probably around 75% more this month than we usually do. And frankly, that's ridiculous. Before we started the Whole30, we didn't eat processed foods, we didn't coupon. We just bought healthy good quality ingredients and made meals. But with this? We have to buy more meat because the program has guidelines for how much meat to eat at every meal and that's a decent amount more than we usually eat. And it's expensive. I don't know how people afford to be paleo full time. I understand the concept of buying veggies when they're in season and on sale, and stocking up on other things when they're on sale. 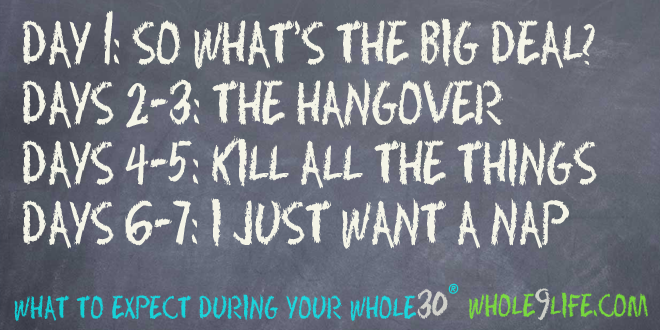 That's what we've been doing both previously and for the Whole30. Let's just say that I was extremely unprepared for how much this experiment would cost. As a whole though, I feel like this experiment is going well enough. It's hard to know how it's working since I don't seem to be going through their stages of withdrawal. Hopefully all this expense works out in the end and when we start introducing foods we can actually tell if we have any intolerances to them or not. Because otherwise it'll just be a very expensive, failed experiment.